Another food experiment, a meat-free lunch. And the burning question, did the girl notice? 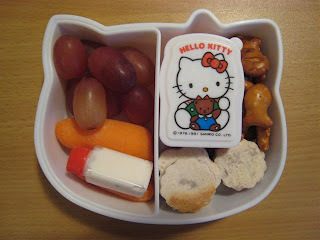 She took cream cheese & jelly flower sandwiches, goldfish pretzels, vanilla yogurt with blueberries (in the HK container), carrot sticks with ranch dip (in the little bottle) and grapes. Well? Did she? You can't just leave us hangin' like that!